Researchers at the U.S. Military Academy at West Point recently conducted a study on the effects of tech use in classrooms by randomly assigning 450 students to one of three sections of the same required economics class: one that permitted laptops and tablets, one that did not, and a control group. Since West Point is a military academy the environment and coursework is substantially equal for all students, and a randomized controlled trial is the highest-quality study available in social science, so the results of this study have a high reliability. Researchers found that the students permitted to use tech devices in class suffered a third of a standard deviation drop in their performance — roughly the difference between an A- and a B+ average. In other words, a student prevented from using screens for class would have an A- grade average, but if allowed to use a laptop or tablet for study instead averaged a B+ grade. 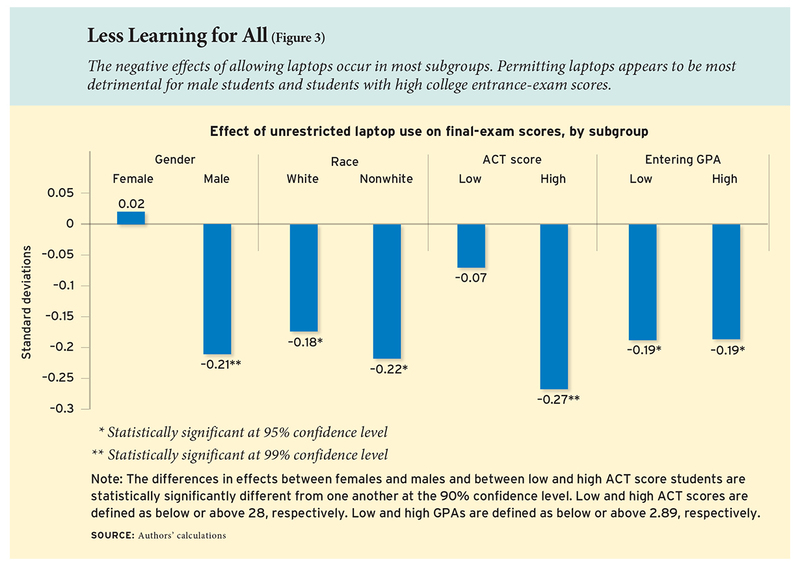 Computer use significantly degraded student performance. These negative effects seemed to be particularly strong for males and for high-performing students, as the graph below from the study shows. The authors caution that these study results need more confirmation due to the sample sizes (West Point is 83 percent male and populated with high-performing students, so there were far fewer females and low academic performers for comparison). “Although students overwhelmingly like to use their devices, a growing research base finds little evidence of positive effects and plenty of indications of potential harm,” the study authors write in the journal Education Next. It’s not just the computer users themselves who do more poorly in school, either: A 2013 study found that students earned lower test scores both if they personally used a laptop during class and if he or she didn’t use a computer but sat near a computer user. Our findings are consistent with those of a recent study by Richard Patterson and Robert Patterson, which found that in-class computer usage reduces academic performance by between 0.14 and 0.37 points on a four-point grade scale among undergraduate students at a private liberal-arts college.